News from LMCU: Make the most of your summer spending with MaxRewards! Make the most of your summer spending with MaxRewards! This time of year, there’s no shortage of things to spend money on – vacations, family BBQs, back-to school supplies, clothing. 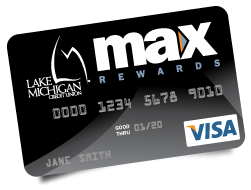 Why not get a little something back on your purchases with a MaxRewards Visa card? You’ll get 3% cash back on gas*, 2% on groceries, and 1% on everything else. To apply, call (800) 242-9790 or stop by any branch. You can also apply online 24/7 at lmcu.org!